After the witch horror movie "Dead of Night" by Naoyoshi Kawamatsu caused sensation at the 18th JFFH, he is now back to show us his new movie "My Name is R IK U". In spring 2014 a skeletonized infant body was found in a flat in the city of Atsugi. 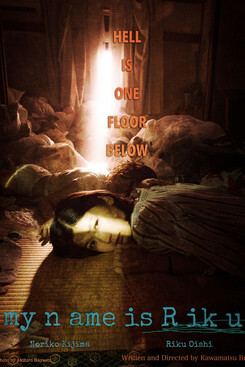 Kawamatsu dedicates his psycho-horror-drama, which is based on true events, to the agonized soul of a 5 years old child whose suffering didn't find any attention from the adults. Naoyoshi Kawamatsu has already been a guest at the JFFH in 2013, 2015, and most recently in 2017 with "Dead of Night". Kawamatsu specialized early in the genre of horror and zombie movies, which he also tried to put his own stamp on as a production designer. His first breakthrough in the film industriy was as an assistant director (Trapped Ashes) before he began filming his own scripts. At the 19th JFFH, he is now exploring the limits of human existence with his haunting horror drama "My Name is R IK U". my n ame is R ik u wurde auf dem 19. JFFH 2018 gezeigt.